What wives need to know about expressing emotions! Do you tend to get loud when you get upset? Are you prone to big, dramatic displays of your emotions, whether joy, frustration or sadness? Well you might not know this, but most men are really uncomfortable with big displays of emotion. This isn’t true for ALL men, but for most men. In other words, if you’re a drama queen….your husband will likely try to escape your presence! He just doesn’t know what to do with your larger-than-life emotions. Maybe this is why 1 Peter 3:4 advises wives to have the beauty that comes from a “gentle and quiet spirit“. Most men much prefer that their wives discuss their emotions, fears, disappointments, frustrations, and joy in a calm manner. 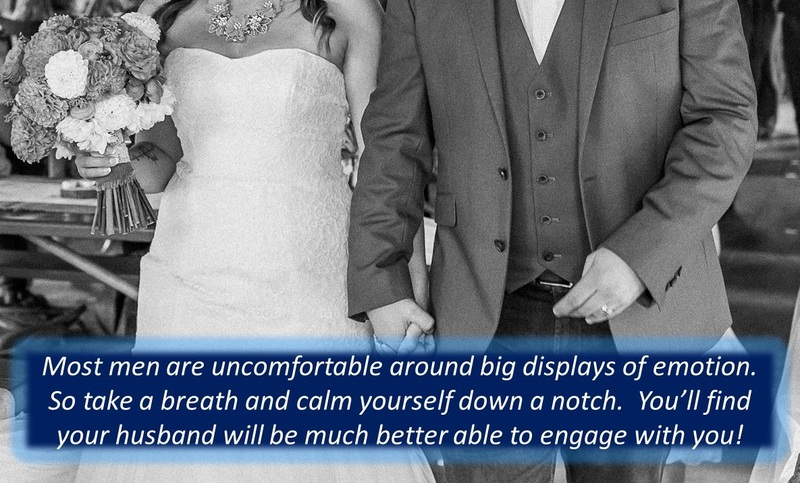 Your husband will be much more likely to engage in a meaningful discussion with you if you can speak in a normal tone of voice, without waving around your arms. Try it!